A team has developed micro-rockets that can neutralise chemical and biological weapons. Powered by seawater, the micrometre-sized rockets are capable of degrading agents like anthrax and sarin. The rockets can "swim" in contaminated samples to decompose them, before eventually self-degrading. 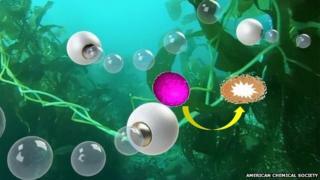 Published in journal ACS Nano, the team says the technology could also decontaminate environmental waste. Prof Wang said it could degrade both biological weapons and nerve agents like sarin, commonly used as weapons in the Middle East. "Our rockets can protect against these, faster, cheaper and using less reagents," he told BBC News. The rocket is made from magnesium coated with titanium dioxide. A small eye-like opening exposes the magnesium which reacts with the seawater causing a "bubble propulsion" effect which powers it forward. This propulsion then enables titanium dioxide to react and break down chemical and biological agents. Titanium dioxide is already known for its amazing ability to break down pollutants. It has previously been used for self-cleaning windows and engineers have even coated cotton with the chemical in an attempt to make clothes clean themselves. The UCSD scientists say that titanium dioxide is also extremely useful for degrading chemical and biological warfare agents. It produces no toxic waste material and does not need chemicals which have toxic by-products. One of the next challenges will be to scale up the project to enable the micro-motors to clear a large area of contaminants. There are broader impacts of the technology too, said Prof Wang. His team are now working on a similar motor which could be used to help treat disease by targeting cancer cells, or it could release drugs inside the body. The project was funded by the Defense Threat Reduction Agency, a US government organisation.